An urgent examination of one of the biggest global crises facing us today–air pollution–looking at the return and drastic worsening of the problem, and what we can do about it. A shocking realization that has come out of the world-wide diesel fuel scandal, wherein car manufacturers concealed how highly polluting diesel fuel was: Air pollution is much, much worse than we knew. How did it get this bad, and how can we stop it? Now, as more of us live in cities, we are closer than ever to pollution sources and the detrimental impact on the environment and our health has reached crisis point. The Invisible Killer will introduce you to the incredible individuals whose ground-breaking research paved the way to today’s understanding of air pollution, often at their own detriment. Gary Fuller’s global story examines devastating incidents from London’s Great Smog to Norway’s acid rain; Los Angeles’s traffic problem to wood burning damage in New Zealand. 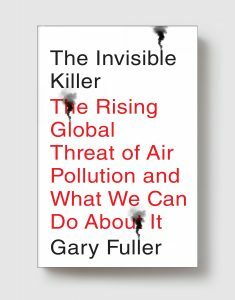 Fuller argues that the only way to alter the future course of our planet and improve collective global health is for city and national governments to stop ignoring evidence and take action, persuading the public and making polluters bear the full cost of the harm that they do. The decisions that we make today will impact on our health for decades to come. Dr Gary Fuller is an air pollution scientist at King’s College London. He leads the development of the London Air Quality Network, making information on air pollution more accessible to the public. He writes the Pollutionwatch series for The Guardian and was one of Evening Standard’s ‘Progress 1000’ selections, highlighting London’s most influential people in 2017.